John Snow is viewed by many as a pioneer in disease mapping. He was a founding member of the London Epidemiological Society, one of the first professional organizations devoted to the field of epidemiology. 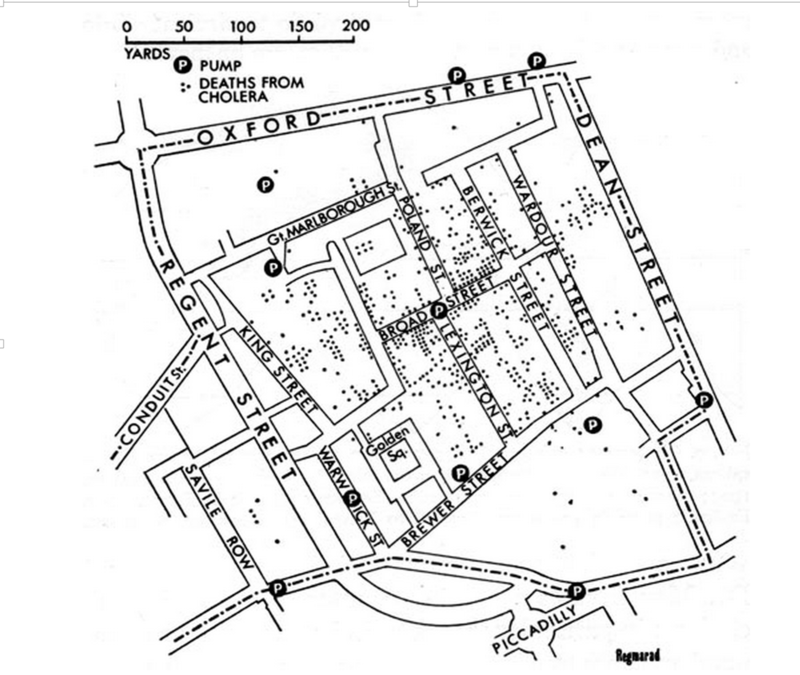 For the 1854 cholera outbreak in London’s Broad Street region, he presented a map of disease outbreaks around the Broad Street Pump to the Board of Guardians of St. James’ parish, the fundamental tier of local government that was in service. In consequence of what he said and the evidence that he presented, the handle of the pump was removed on the following day. Contemporary epidemiologists view removing the pump handle as appropriate and honor Snow’s action to safeguard the public, even in the face of biological and epidemiological uncertainty. Not surprisingly, the number of people infected with cholera dropped. From an aging population to the growing threat of pandemic influenza and other emerging infectious diseases as well as the rapid growth of obesity and other chronic illnesses, the most persistent and costly challenges to American health and well-being fall increasingly on the public health system and on public health professionals at all levels. Unlike health care, which often intervenes when an individual is already sick with a costly disease, the focus of public health is prevention rather than treatment of diseases. Public health professionals, working with state and local health departments, laboratories, and other public health organizations, play a vital and increasingly central role in protecting a population’s health. Yet the Center for Disease Control (CDC) and other public health observers have repeatedly identified deficiencies in public health infrastructure and workforce. Regional interstate planning, preparing for mass vaccination and the distribution of medical supplies, and development of adequate surge capacity are incomplete or insufficient. The Government Accountability Office concluded in 2004 that “no State is fully prepared to respond to a major public health threat,” an assessment that the CDC reiterated in 2008. 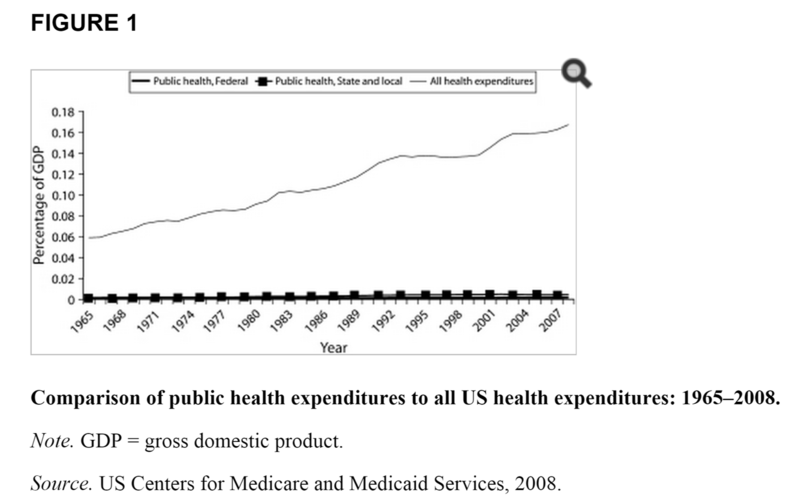 One might look at Figure 1 and think, where are the lines for public health expenditures on federal, state, and local levels? They’re there, almost completely parallel to the x-axis. Federal public health spending underperformed a number of other U.S. health sector expenditure categories overall. As a percentage of all U.S. health expenditures, federal public health spending was lower in 2008 than it was in 1966. To make matters worse, the Fiscal Year 2015 request proposes a $51 million decrease for the immunization program due to an expectation of increased insurance coverage for immunization services in 2015. This is yet another cut to public health spending that will undoubtedly affect population health. The Affordable Care Act (ACA) purports to expand access to preventive care for the uninsured and underinsured population. Health and Human Services estimates 76 million Americans are now eligible for expanded coverage of one or more preventive services. More specifically, insurance providers are required to provide the combination measles, mumps, rubella and the varicella vaccine without cost-sharing. Because preventative services are now supposed to be covered under one’s insurance policy, it is expected that this decrease in funding for immunization programs will not affect disease outbreaks. This lowered funding will affect 317 programs which educate immunization providers, raise public awareness, manage vaccine shortages, and prepare and respond to outbreaks. The funding for the 317 programs is divided into vaccine purchasing, immunization infrastructure and program operations. When the program budget was cut by $51.5 million last year, vaccine purchasing was cut by $37.5 million. Program operations, which contribute to disease surveillance, public awareness and provider education, took a $14 million cut. While proponents of the ACA said the majority of the proposed fiscal 2016 cuts again will go toward vaccine purchasing and won’t affect immunization infrastructure funds, this cannot be the whole picture. The families and children currently using these programs will be in jeopardy because insurance coverage alone is not enough to ensure high vaccination rates. The local and state governments are also at risk because they have less money to prepare for outbreaks. In the wake of the measles outbreak, why is the Obama administration choosing to cut life-saving public health infrastructure? Tags: Affordable Care Act, CDC, FY2015, health expenditures, measles, MMR, outbreak, public health, vaccines. Bookmark the permalink. sharing in delicious. And of course, thank you to your sweat!